I happened to meet this young lady on the train this morn when a woman sitting next her started coughing uncontrollably. Just as I have been for several days, no doubt due to allergies. I offered the woman gum to aid her in her cough session, told her the mint flavor would soothe her throat. The young lady and I, not the cougher, started asking one another what to do when you can’t stop coughing, put your hands over your head or something, we shared a giggle. Anyway, I peeped her earrings and thought they were adorable, so of course I told her. I can’t help compliment people when they look good. To my surprise she said she was a designer. Yay, love meeting aspiring designers. 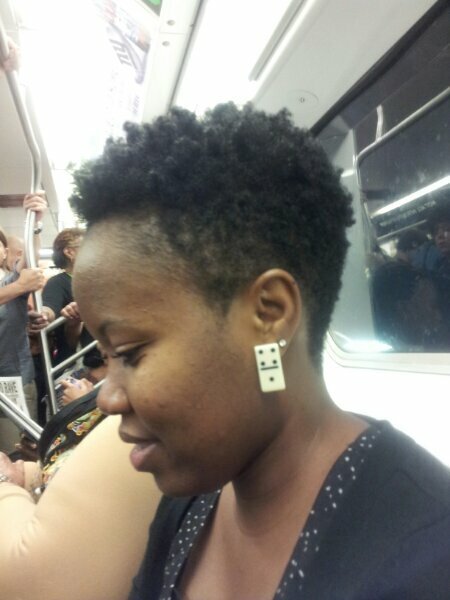 She told me she created these domino earrings and designs handmade jewelry. She also has an extensive vintage collection and loves finding pieces when she travels. She is branching into the vintage style area, looking to share her finds with the public. Happy that the cougher had a hand in connecting us, funny how I meet people, if you only knew my life on a daily basis. So without further ado meet Ms. Derline Volney. I snapped a pic of her and the earrings. I am going to have to purchase a pair and get in on this domino effect! You can contact her at Facebook.com/Confessionsofbeauty or on Instagram/Confessions of Beauty.